Taipei, Taiwan, November 3, 2016 –Advantech (2395.TW), a leading provider of embedded computing solutions, today unveils its new comprehensive range of embedded computing platforms with the latest Intel® Atom™ Processor E3900 series, Intel® Celeron® Processor N3350 and Intel® Pentium® Processor N4200 (formerly Apollo Lake). These platforms comprise of Computer On Modules SOM-3569, SOM-6869, and SOM-7569, Embedded Single Board Computers MIO-2360, MIO-5350, PCM-9366, and PCM-9563, and an Industrial Motherboard AIMB-217; as well as Intelligent SystemsUTX-3117, ARK-1124, and ARK-2231R. 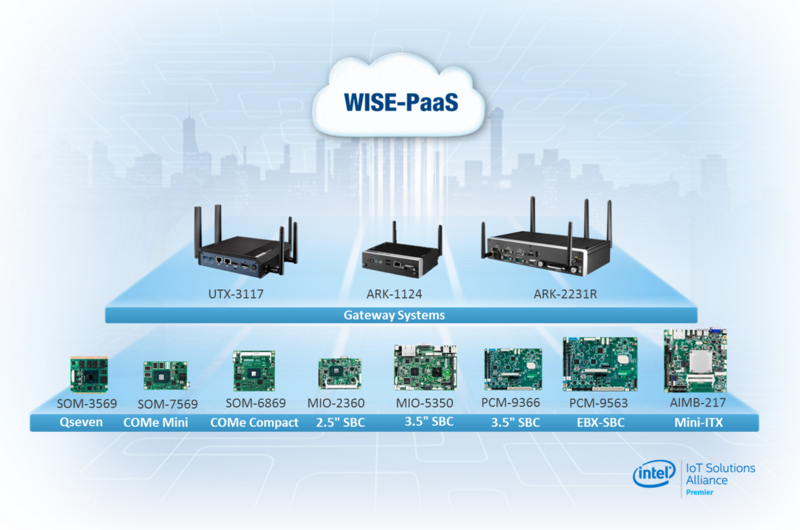 With the latest Intel Atom™/Celeron®/Pentium® processors and Advantech’s exclusive WISE-PaaS integrated IoT platform software services, these Advantech Embedded products bring efficiency, security, and connectivity to embedded computing with essential features that balance cost, performance, and power; making them ideal for IoT, retail, industrial automation, digital surveillance, medical and more. Based on Intel’s 14nm tri-gate process with the new Goldmont microarchitecture, the latest Intel® Atom™/ Celeron®/Pentium® processor SoCs bring Intel’s reliable compute performance, security, and powerful media processing performance to embedded computing systems. Enhancements include up to 30% computing and graphics performance, and up to 15% increase in battery life. Advantech developed its latest series of embedded boards and systems with Intel’s technologies in a wide range of form factors, including the Qseven SOM-3569, the COM Express Compact Module SOM-6869, and the COM Express Mini Module SOM-7569. More form factorsinclude the 2.5” Pico-ITX SBC MIO-2360, the 3.5” SBC MIO-5350, and PCM-9366, the EBX SBC PCM-9563, the Mini-ITX Motherboard AIMB-217, the IoT Gateway System UTX-3117, and the Fanless Embedded Box PCs ARK-1124, and ARK-2231R. Powered by the latest Atom™/Celeron®/Pentium® processors, each of these devices delivers better, more reliable performance, superior media functionality, and longer battery life to empower real-time computing in IoT applications. Advantech’s latest embedded boards and systems are equipped with multiple OS, value-added software, and built-in WISE-PaaS, an integrated IoTplatform software service for remote management, system security, and pre-configured cloud services that mitigate your development effort and empower your IoT solution. WISE-PaaS partnered with Microsoft Azure to allow seamless hardware and software integration and analytic tools for data analysis. Furthermore, Advantech will launch WISE-PaaS Marketplace, an online software shopping website, to provide diverse IoT Cloud Services, Security Services, WISE-PaaS Software Services, and IoT Solution Packages integrated with IoT Cloud solutions to accelerate and transform your business. The complete product lineup will be available in 2017 Q1 to Q2. For more information, please visit: www.advantech.com.